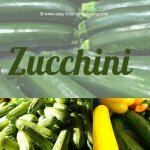 Powdered Broccoli – It's not just a side dish anymore! Seriously though, Julius wrote in to say that he'd read the page on "dehydrating broccoli" but he wanted to add a personal story as to what he does with his fresh broccoli florets and fresh broccoli sprouts! His story begins four years ago when he suffered from bladder cancer. Since taking his potent mix (details coming up) he's not had a single recurrence. Julius takes fresh broccoli sprouts and he dehydrates it at 85°F — and may take as long as two days as he says he wants it to be completely dry. He then grinds the dried product in a coffee grinder, and stores it in his cool basement. I mix 1/2 teaspoon of my own dehydrated broccoli sprout (dried with a dehydrator and ground to fine powder with a coffee grinder) plus 1/2 teaspoon of store bought broccoli powder from "Z Natural." 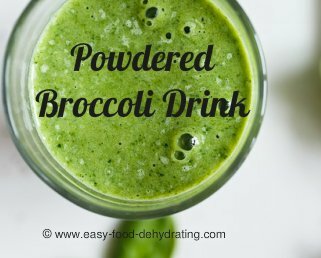 I put this mixture in about 2 tablespoons of almost anything – usually something like Gatorade because I can't tolerate the taste of broccoli sprouts! I stir with a spoon and gulp in one swallow, followed by a short drink of the Gatorade or coffee or anything else I have nearby to kill the taste. I usually get up at 5 AM and heat some coffee and head down my basement computer room. I almost always take this powdered broccoli mix early while I am donkying around in my basement after I have my coffee and a "Little Debbie" sweet. Now, please hear me. Make real sure that you store your ground up broccoli sprout in a glass jar that is air tight. Also the broccoli powder you buy comes in a sealed plastic container. You want to also take it out of this container and dump it in another air tight jar. Additionally I put one of the silicone packages that come with electronic gadgets or certain pill bottles to keep out the moisture. Now I am not sure that this does anything, but from all the studies I have read, this is the only thing that I have a bit of confidence in to reduce the probability of the bladder cancer coming back. Bladder cancer has a high chance of returning. It has been four years for me and so far and I am content. You know, people seem to ignore some basic reasons for serious illnesses, but such simple things like smoking, becoming extremely dehydrated, and eating the wrong foods continuously can cause many problems. Like I told my doctor ... "There is no safe medicine, and there is no perfectly safe food." All have some kind of side effects. By the way ... I understand that this mixture not only tends to reduce the chance of cancer in bladders, but also ovarian, breast, prostate, and stomach. As cheap as this stuff can be acquired, to me eating powdered broccoli, is worth it. They preach that eating broccoli does this and that. Don't believe it. The substance that does this good is sulforaphane and you must have an enzyme called myrosainase to activate it. Fresh broccoli has 2 sacs that when you chew the broccoli, they combine to form sulforaphane. If you cook broccoli all the enzymes are lost and you are dreaming about benefits. Same for frozen broccoli. You can just eat fresh broccoli sprouts, but there is no way I can eat that stuff raw. Please understand that I am not a health food nut and certainly not a nutritionist, although I believe in some foods that are good and some to avoid. On the contrary, I love junk food, hot peppers and red wine. I do like to explore things like time travel and what happens after you die, the nature of medicines , and stuff like that. It is just a hobby with me which is better than getting into trouble. Thank You Julius, for sharing this super information and your personal experiences with powdered broccoli.